Dominguez, Ignacio X., Rogelio E. Cardona-Rivera, James K. Vance, and David L. Roberts. “The Mimesis Effect: The Effect of Roles on Player Choice in Interactive Narrative Role-Playing Games.” In 34th Annual Chi Conference on Human Factors in Computing Systems, Chi 2016, 3438–49. San Jose, CA: Assoc Comp Machinery; SIG CHI, 2015. doi:10.1145/2858036.2858141. 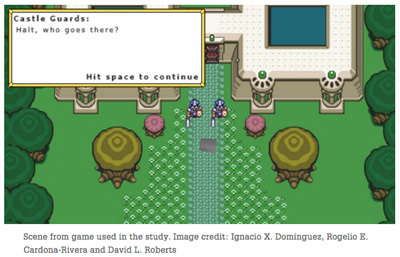 This study (n=210) examines the behavior of players in a computer role-playing game where they control a character through an unfolding story. The study shows that the players consistently take decisions based on 3 stereotyped roles. This consistency, named "mimesis effect", is verified in every cases : if the role is assigned at the beginning, if the role is selected by the player, and also (surprisingly) if the player have no information about any role to play. eg. if a player is attributed a rogue, or chooses to play a rogue, or has no role attributed and starts to play stealthy, he will keep playing like a rogue until the end of the game. The same for fighter or mage. In validation phase, the 3 roles were calibrated following D&D 4e TRPG stereotypes (fighter, mage and rogue, either acting strong or magical or stealthy). The subjects of the study (and the validation sample) were mostly young male computer and/or tabletop RPG gamers. Playing one role or another doesn't change the success of the actions.